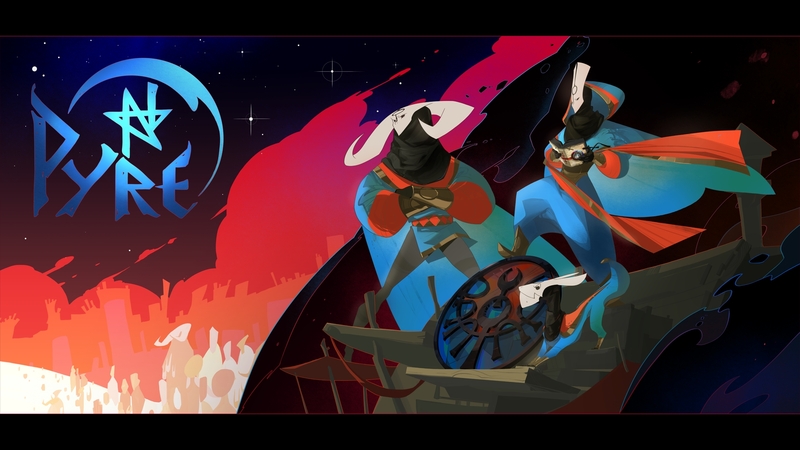 Pyre, the third and most recent game developed by Supergiant Games, is a vastly different experience from their previous two releases. 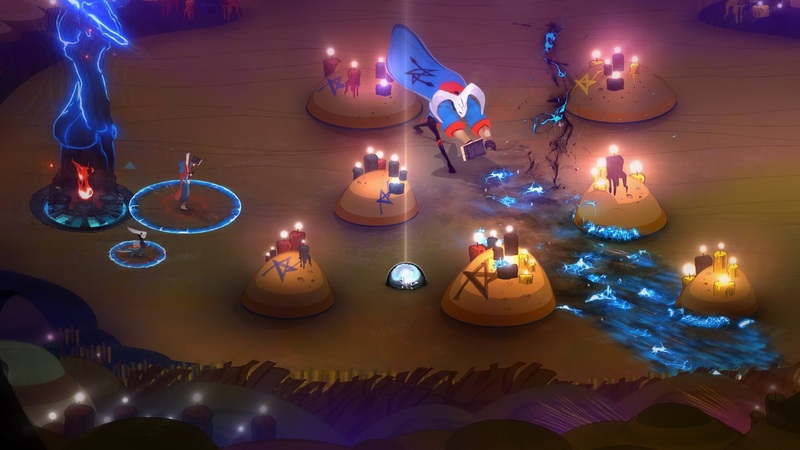 As their preceding titles focus on the journeys of one titular character and fighting through their enemies, Pyre completely forgoes many traditional concepts such as these and blurs the lines between protagonists and antagonists as well as challenging our perceptions of right decisions. 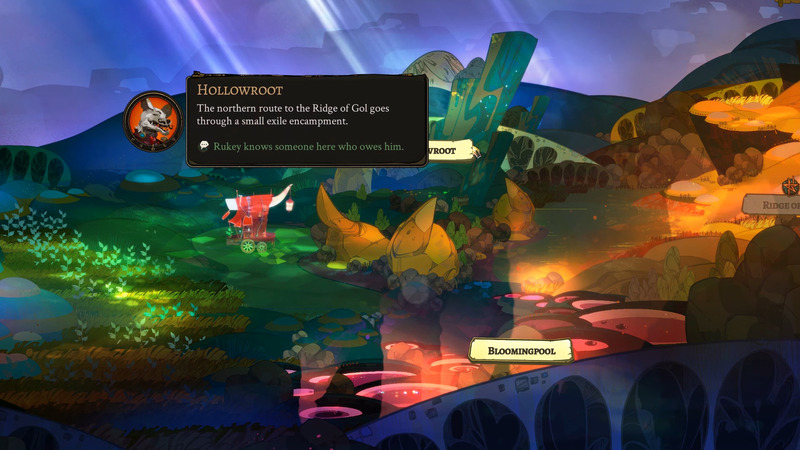 Where the previous two games had clear goals and had one or two definitive endings, Pyre disregards these common elements in favor of multiple paths, multiple endings, and an experience that will challenge players to consider and decide for themselves what the outcomes are and whether they are truly good or bad. 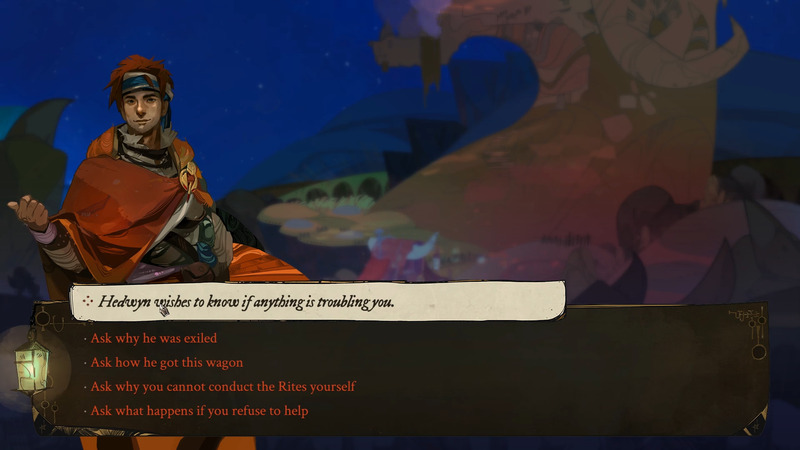 The story of Pyre starts out simple enough, but quickly unravels into a vast, multi-layered epic. You play as the Reader, a literate character in a world where literacy is forbidden, and are exiled to the Downside, a kind of perdition where individuals who break laws and taboos from the Commonwealth are banished. A group of individuals, the Nightwings, rescue you and happen to need a Reader in order to conduct the Rites. Through the Rites, three-on-three tournaments against other groups of exiles, one can gain their freedom from the Downside and return to the Commonwealth. Of course, it’s not nearly so simple, for as your initial path leads to your first Liberation Rite, you learn that only one of your party can escape the Downside and return to the Commonwealth, while the remainder of your party must stay behind and continue competing towards another Liberation Rite. Finally, you also learn of a revolutionary plot, the Plan, that could have drastic consequences and whose success is directly tied to your group. And so the Reader is forced to choose how to reach the remaining Liberation Rites, how to progress this revolt if you so choose, and ultimately who to save from exile. Pyre’s narrative is easily one of the more intriguing I’ve come across. 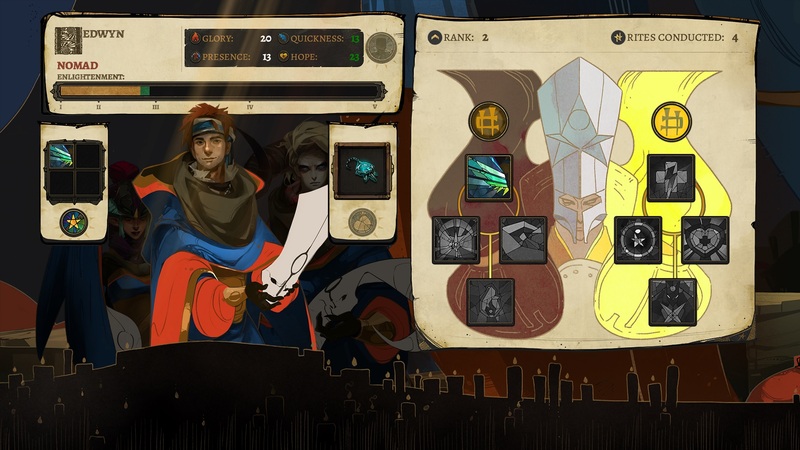 The central plot of Pyre is fairly straightforward in that your goal is to free your friends, but the entire story is so much more complex than this. The history of the Rites, the Scribes, and the Books they leave behind, all have influence on the events unfolding. The web spun from all this backstory and how it relates to the Commonwealth’s history, the Downside, and even your team’s current predicament is fascinating. There is plenty to uncover and those, like myself, that live for a deep story will not be disappointed. The story is conveyed similarly to a visual novel and almost every decision you make has a consequence. Who you free, when you do so, the choices during conversations, even your gender; all of this will influence your relationships with your teammates and their relationships with one another. Learning of the struggles of the Scribes, the first to roam the Downside, is captivating. Even more so is learning about your teammates, their personal histories, and even the backstories of your opponents. Which brings me to Pyre’s character development; it’s impressive. I found it easy to invest in these characters to the point where it was a struggle to free them after a Liberation Rite, simply because I kept wanting to learn more about them and to have more interactions with my group. Throughout the journey, each character will open up in their own ways and you have the pleasure of knowing them individually and through group interactions. That atmosphere they create is wonderful, making it all the more difficult to separate them from each other as the story progresses. And what truly impresses me is after your first Liberation Rite, you start learning more about your opponents, their backstories, and the relationships many of them have with your teammates. Pamitha and Tamitha, the Harp sisters, have a tumultuous past and during play, you may become engrossed with their falling out, to the point of trying to help, even if it means throwing, as in purposely losing, a Liberation Rite for the sake of the rival sister. There are many instances like this, in which opponents may end up swaying your decisions and the paths you take may not feel like the right ones, or rather they may not yield what you believe to be the best outcomes. For example, I sympathized with The Fate, a Triumvirate led by Dalbert Oldheart. Here is a character exiled for celebrating a holiday closely related to his people and was punished for it. Ethnic persecution is the reason he suffers and his son, Almer, shares his sentence when he fought back as they detained his father. Now, Dalbert participates in the Rites for his son. That struck me and led me to think that perhaps this group has a valid, virtuous reason for enduring the Rites. So much so that perhaps throwing a Liberation Rite for the father’s sake of his son could be a worthy choice. But, if you do throw the match and Almer is liberated, that could, in turn, affect the ending outcome of one of your teammates who seems to have developed an attraction to Almer. The level of depth achieved with the interweaving of character backstories and their predicaments is genuinely impressive. Unfortunately, not everyone is treated equally, as there are several characters, both teammates and opponents, who failed to leave a substantial impact on me, instead coming off as mold fitting, lacking in appeal. Whether I chose to keep them or set them free, I remained unfazed regardless, which is a stark contrast to the emotional impact I felt with the more developed, more sympathetic characters. Having said this, there are plenty of individuals to root for and so many of these worthwhile interwoven paths to discover; the emotional impact they leave is palpable and enthralling. Despite the sheer strength of the narrative and its characters, there is a noticeable dip in quality when it comes to Pyre’s gameplay. 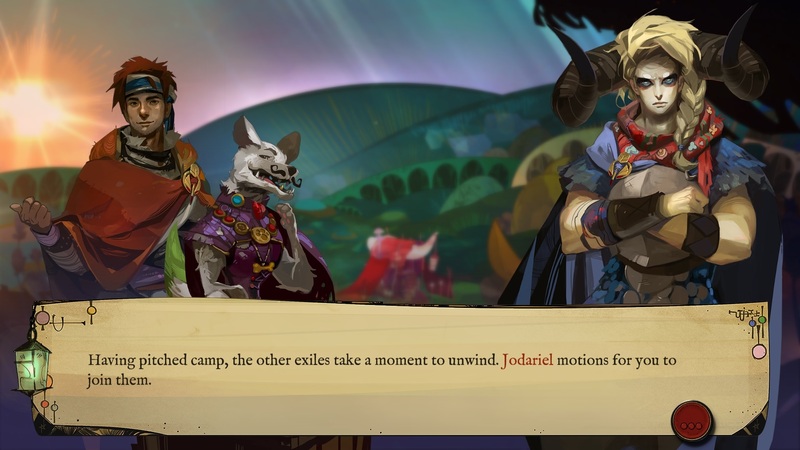 As I mentioned earlier, Pyre’s story delivery mirrors that of a visual novel. 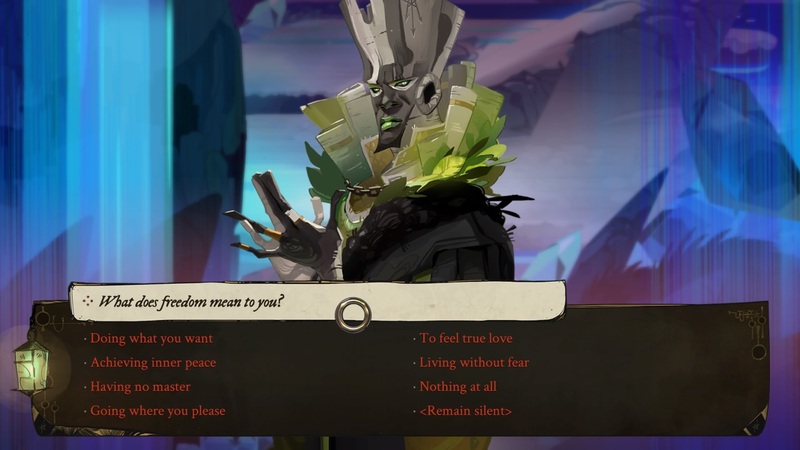 I would even go so far as to argue that Pyre would perhaps have been a more successful experience if it were actually a VN. However, that’s not to say the gameplay is bad, on the contrary, the gameplay can be quite fun. Dispersed throughout its narrative are the Rites, the competitions in which groups of exiles compete to absolve their sins and take steps towards freedom from the Downside. These competitions pit groups of three, called Triumvirate, against each other in a game in which the characters must collect a single orb and place it into the opponents’ pyre. As the orb is placed into a pyre, it will extinguish it by a certain value dependent on the character who placed the orb. During this game, only one character can be controlled at a time and it becomes imperative to learn how to maneuver your characters together to retrieve the orb, move up the play area, and place the orb, all without being banished. Normally, each character produces an aura, an energy field that will temporary banish an opponent from the play area if hit. This aura can be cast to directly launch an attack as well. When a character has the orb, however, they lose their aura and are completely vulnerable to enemy attack. If banished, they will only return after a specific period of time. Only once a pyre flame reaches zero and is completely extinguished does the Rite finish. There is a wealth of depth to gameplay, however, there are significant issues as well. For one, despite the variety in opponents and playfields, playing through a set of Rites to reach a Liberation Rite can get tiresome, especially if you’ve played through the tournament three or four times already. Also, the Rites can get repetitive, again due to volume of Rites played. Variety and depth can only carry the gameplay so far and by the end, I found myself fatigued with gameplay, only continuing my progress for the narrative elements. Compared to the length of time spent reading the narrative pieces, these ten minute breaks don’t complement the rest of the game as strongly as I’d hoped, as the contrast between narrative and gameplay is sharp and does not mesh as well together as I’d expect. The mini-game feel of gameplay definitely limits its impact; perhaps a more developed combat element or a more complex set of conditions in addition to the sport-like element would have strengthened its overall effect and better fit together with the visual novel styling. While there is plenty of fun to be had, that enjoyment has its limits, potentially wearing thin to the point of player fatigue. 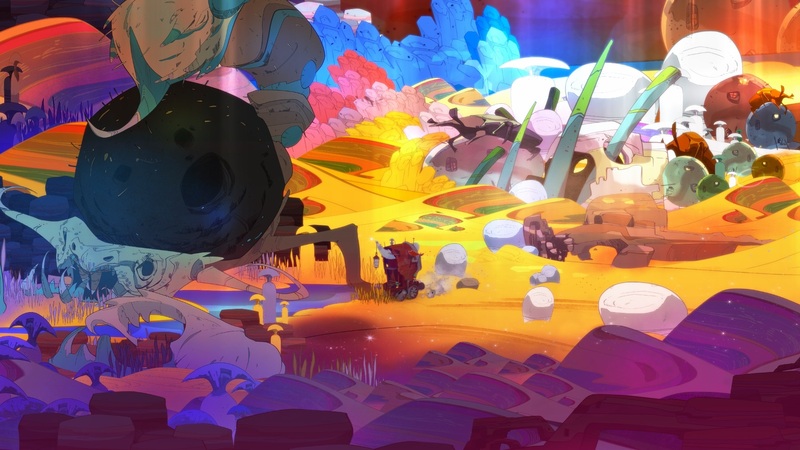 Supergiant Games always impresses with its aesthetic direction and Pyre is no exception to this trend. Visually, Pyre is incredible. The 2D art direction beautifully utilizes a paint canvas style and bold coloring to depict its character portraits and backgrounds. The detail of the characters is outstanding, bringing dimension to them and adding to the narrative build of their personalities. The way Hedwyn speaks and the tones of his conversations match his smile and approachable, easy going visual appeal. The sharp, curt tones of Jodariel’s thoughts and rebuttals fit perfectly with the permanent scowl her portrait depicts and even more so when she reveals her rare, subtle smile. This artistry and the narrative build upon each other perfectly to produce believable characters, easy to invest in during their campaign. The backgrounds are equally impressive and also help strengthen the story elements. Most of the locales in Pyre are littered with danger and destruction, appropriate for this type of purgatory that is the Downside. Skeletons, swamps, lava flows, wrecked ships; all are vividly displayed using a vibrant, robust color palette. Despite using brighter colors in drawing perilous environments, the contrast works nicely and I found myself just staring at them during play to try and absorb every detail. My only real complaint is in regards to the Rites. The character models used and the playfields are a touch bland, lacking the same vividness and charm the rest of the game possesses. I will say I’m very impressed with the lighting effects and use of color pallet during these segments. Yet, I wish the art efforts were consistent throughout. As for the soundtrack, Pyre has a fairly strong set of tunes to enjoy during play. Darren Korb is able to produce a tone and feel that matches well with the hazardous and destitute Downside. Conversations feel livelier and arguments and trash talk before the Rites feel more emotional and intense with the song pairings and the tones they impart. While I enjoyed the soundtrack overall, I do feel this isn’t Korb’s strongest work, however, as I felt several of the tracks were just there in place of empty silence. Not usually his norm, several tracks fail to add to the moods of events on screen and are easily ignored. While there are several successes, the times I found myself unmoved by the background tracks during major plot moments were significant. A sound score should enhance the experience throughout, but here, it fell short of that goal. Pyre is a wonderful experience. The story is captivating and the characters are full of charm and depth. It’s a pleasure to become invested in their tales and natural to come to care for them throughout their struggles. I would have appreciated more detail, though, for both story and characters, as I feel there is too much that is glossed over or never properly developed. The gameplay, while not revolutionary and somewhat tangent to the visual novel style of narrative, is still clever and fun, especially with the variety the characters can bring to your strategy. The visuals are simply incredible, yet I feel the soundtrack wasn’t quite up to the same levels as Transistor or Bastion. Regardless of its shortcomings, Pyre delivers in enjoyment. With my reading speed, conducting practice Rites, and my just taking in the atmosphere, my first playthrough took about 10 hours. That does not include subsequent playthroughs and discovering all of the individual and paired endings the game offers. Although I’m giving this a 3.5/5, it only just misses the 4/5 mark. 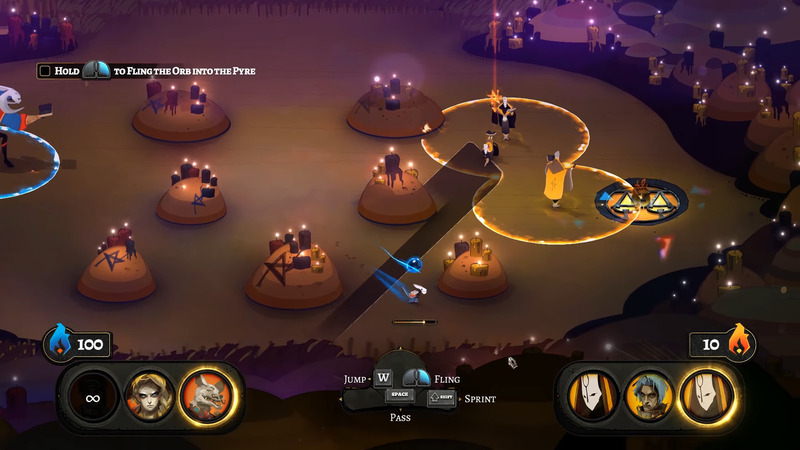 With its intrigue and originality, Pyre is definitely a game that delivers enjoyment and is unquestionably worth playing.